The USWC Championships were recently held in Los Angeles, California on Sunday, January 26, 2014. 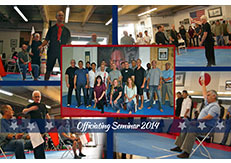 In conjunction with the championships, an IKO Officiating Seminar was conducted under the auspices of Shihan Katsuhito Gorai & Shihan Stuart Corrigal. Twenty IKO members from Japan, Australia, Russia, Poland, Canada and the USA attended the clinic. 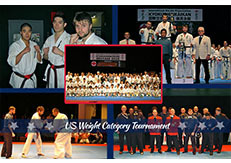 All aspects of IKO tournament officiating were covered in preparation the the 2014 USWC Tournament. "We arrived in LA the day before the tournament. Everything is pretty standard, eat, sleep, and be ready for the fight. The tournament venue is quite nice, it's a small theatre with comfortable seats for the spectators. We warmed up a bit and started fighting at around 3 PM. My first fight was against Reese from Australia. It was a good, back and forth fight. I don't remember the details, but Reese has very good punches and stamina. His axe kick also caught me off guard at the beginning of the bout. At the end of the fight, I lost via 2 hikiwake, and 2 Reese. After the fight, I used all my energy to help coach Andrew and Mark. Andrew had a good and close fight too, even though it didn't go his way, the training that he did with us clearly showed. Mark did very well against top fighters, excellent punches and low kicks. Stamina was also top notch. I am very happy to see him getting the 3rd place. Overall, I am very disappointed with my performance and the outcome. As a fighter, we sacrificed a lot of our time to train, including holidays. That's why it always hurts so much to lose. There are so many what ifs, could haves, should haves, but I must not think about them, and just keep training to achieve my goals. OSU!" The US Weight Category Championships is always a high calibre tournament. It can attract big name fighters such as Nicolae Stoian and Darmen Sadvokosav. This particular year was a bit special, as it was the 10th anniversary. 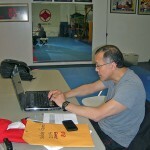 There were four members going from Western Canada this year: Shihan Stuart Corrigal, Andrew Leung (competitor), Jack Shiah (competitor) and myself (competitor). I was happy to hear that this year the venue had moved back to its traditional location of little Tokyo, which is a very nice location. The dojo where you check in, the tournament venue and several excellent restaurants are all located within 3 blocks of the recommended hotel, so there is very little extra stress preparing. Upon arriving we discovered that each of us had gotten a very tough bracket. There were 9 competitors in the middleweight and 9 in the super heavyweight as well, so each of us were going to have to prepare for 3 fights each. After checking in Andrew, Jack and I went back to the hotel to discuss strategies and eat a decent breakfast. Afternoon arrived and we headed back to warm ourselves up. After we warmed up the tournament started quickly. Jack was up to bat first, facing off against Reese, a member of the Australian team for the last world tournament. It was a hard match, with Reese throwing an unexpected axe kick and extra strong punches, while Jack threw back some effective shita tsukis and heel kicks to the leg. In the end it went to Judge's decision and Reese took the fight. Andrew was up just two fights later against Luigi from New York. Andrew threw very sharp uchi matas and set a good pace, but Luigi sped up too much in the last minute and also won it by decision. I was up a short time later facing off against Arkadiaz, a strong Polish puncher who had beaten me once before. The match went into the extension round before I did enough damage to Arkadiaz's legs to earn the win. My second match was against Patrick Sypien who is the top 3 of Europe. This match also went into extension before Sypien got the win by decision, leaving me with a 3rd place finish. Following the third place matches was an excellent demonstration, with kihon, kata and board breaking. This culminated in Sensei Taku breaking 5 blocks of ice at once with a shuto technique. Then into the finals where Reese placed first in middleweight, a Russian fighter with amazing power won the heavyweight division and Daniel from New York beat Sypien in the super heavyweight. This was another excellent tournament hosted by Sensei Taku and the rest of the LA branch chiefs. For fighters wanting to push themselves, this is a chance to fight some of the best without flying to Japan or Russia. I would like to thank everyone involved for helping host this fantastic event. This entry was posted	on Friday, January 31st, 2014 at 9:05 am	and is filed under Uncategorized. You can follow any responses to this entry through the RSS 2.0 feed. Both comments and pings are currently closed.